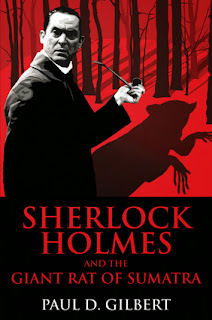 "Matilda Briggs was not the name of a young woman, Watson,” said Holmes, in a reminiscent voice. 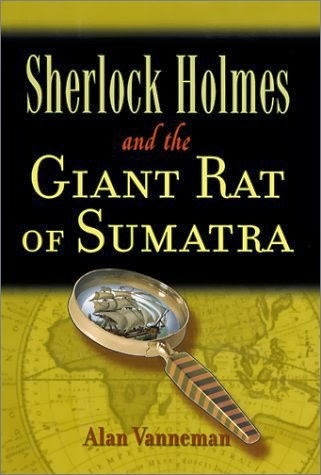 “It was a ship which is associated with the giant rat of Sumatra, a story for which the world is not yet prepared..."
Contrary to the assumption by many aficionados of the Sherlock Holmes stories that it was wholly fictional, there really is a giant rat of Sumatra. Yet despite having been scientifically described as long ago as 1888 (by eminent mammalogist Oldfield Thomas of London's Natural History Museum), until as recently as the 1980s it had remained largely a mystery, even to zoologists. In 1983, however, following an in-depth study of this mighty 2-ft-long rodent, Dr Guy G. Musser (Curator of Mammals at the American Museum of Natural History) and museum research student Cameron Newcomb attempted to disperse the longstanding veil of obscurity surrounding it by publishing its very first full scientific description. Their paper appeared in the museum’s Bulletin. 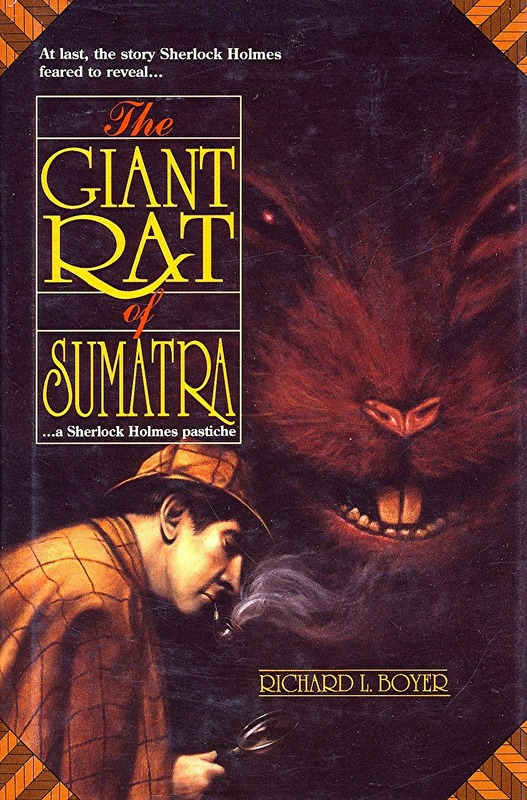 A very large, mountain forest-dwelling species with dense, woolly, dark-brown fur (characterised by extremely lengthy guard hairs) and powerful jaws, the Sumatran giant rat had traditionally been categorised as a typical, Rattus rat. After a meticulous investigation of its anatomy, however, one that surely would have met with Holmes’s own approval, Musser and Newcomb recognized that its aural, nasal, and dental characteristics fully justified separation of this legendary form from the Rattus horde. 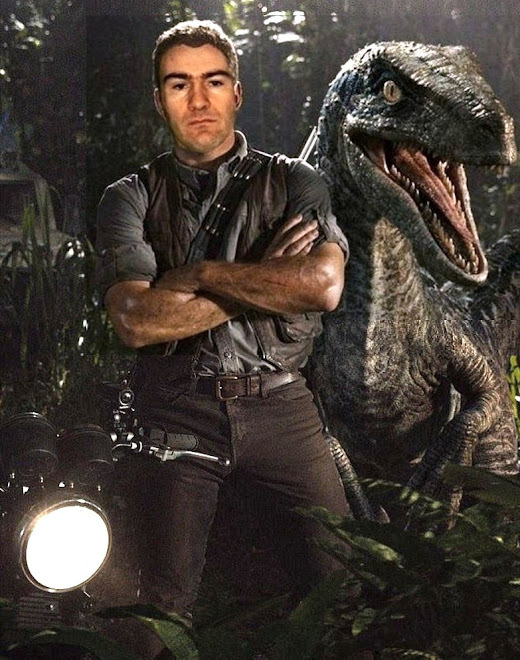 As a result, they officially rehoused it in a new genus, Sundamys, along with two other Asian species. 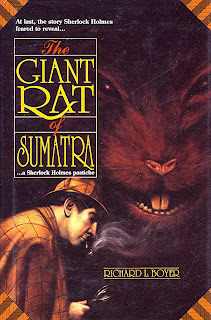 The Sumatran giant rat is now known formally as Sundamys infraluteus, and is not deemed to be endangered, being recorded not only from a sizeable area of Sumatra but also from both Malaysian and Indonesian Borneo. 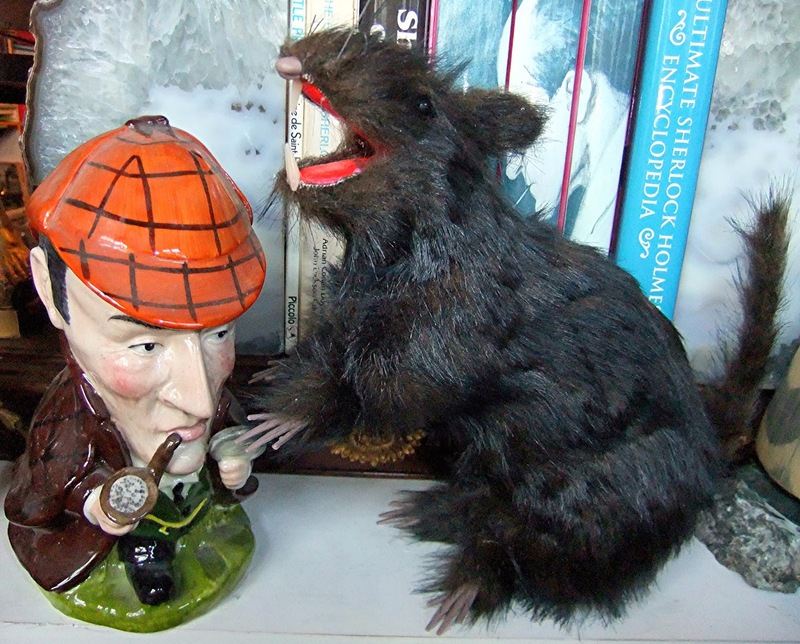 Its two congeners are Bartels's rat S. maxi, and Müller's giant Sunda rat S. muelleri. 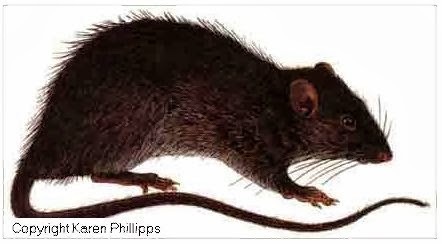 Formally described in 1931 as a valid species but later classified merely as a subspecies of the Sumatran giant rat until re-elevated to the rank of a species in its own right by Musser and Newcomb in their 1983 paper, Bartels's rat remains scarcely-known even today. It is represented only by 21 specimens collected between 1932 and 1935 from two locations on Java by Max Bartels Jr, and is categorized as Endangered by the IUCN. As for Müller's giant Sunda rat: originally described in 1879, this species has the widest distribution of the Sundamys trio, being recorded from Indonesia (including Borneo's Indonesian region and Sumatra, but not Java), Malaysia, Myanmar, the Philippines, and Thailand, and is not deemed to be endangered. It is a primarily terrestrial, lowland species. 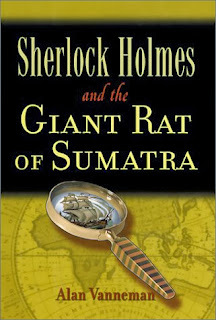 As a longstanding Sherlock Holmes fan, I'm aware that although the giant rat of Sumatra's case was never documented by Dr Watson within the original, Sir Arthur Conan Doyle canon of Sherlock Holmes fiction, it has inspired several pastiches penned by other authors, yielding an extremely diverse range of identities for it. These include such memorable candidates as a tapir, in Richard L. Boyer's novel The Giant Rat of Sumatra (1976); a monstrous mega-rat called Harat who rules a nation of sub-humans in Alan Vanneman's novel Sherlock Holmes and the Giant Rat of Sumatra (2003) (not to be confused with an entirely different but identically-titled novel by Paul D. Gilbert, published in 2010); and, perhaps most bizarrely of all, a preternatural maritime horror, in a story penned by none other than H.P. Lovecraft! 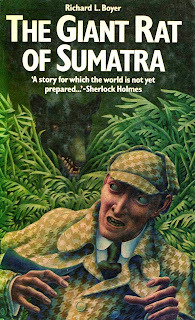 The mega-murid also appears in a novel featuring what must be the most extraordinary literary pairing ever – Sherlock Holmes and Count Dracula! 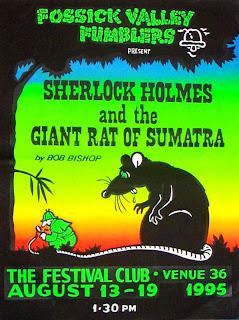 These two iconic if diametrically dissimilar figures reluctantly join forces to confront a nefarious plot to destroy London using plague-bearing rats in Fred Saberhagen's The Holmes-Dracula File (1978), with the giant rat of Sumatra being the principal vector. This rangy rodent has even left its mark in the theatre, with a number of plays having featured it over the years. Notable among these are the Fossick Valley Fumblers theatre group's production, 'Sherlock Holmes and the Giant Rat of Sumatra', written by Bob Bishop, and debuting at the Edinburgh Festival Fringe in August 1995; and an entirely separate but identically-titled comedy musical with music and lyrics by Jack Sharkey and book by Tim Kelly, which was first performed on 31 December 1986, by the Magnificent Moorpark Melodrama & Vaudeville Theatre, Moorpark, California, USA. 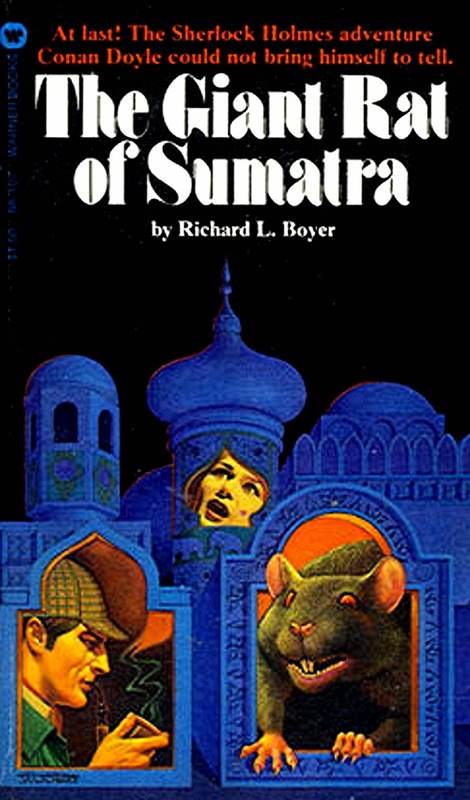 Moreover, Wikipedia has an entire 'Giant Rat of Sumatra' page (click here) containing a very lengthy listing of other literary works (plus some music and TV productions) inspired by this evocative furry entity, as can readily be seen in the screenshot below of that listing. 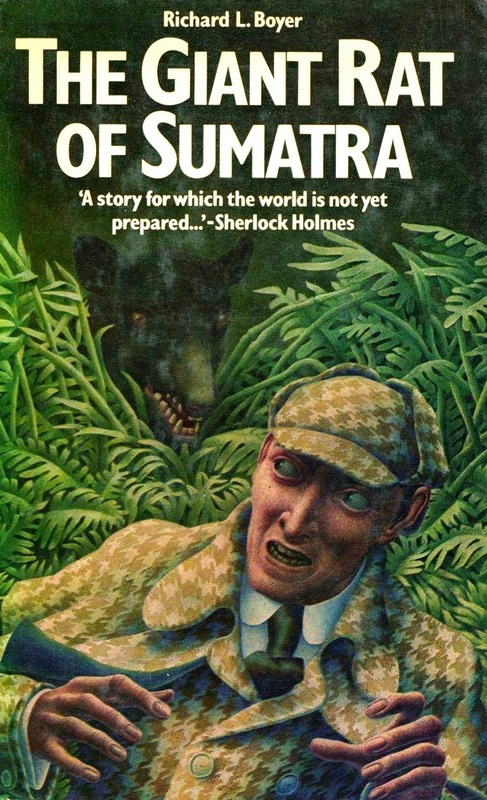 All in all, a pretty impressive modern-day C.V. for a quasi-cryptid originally only mentioned very briefly in passing by a fictitious detective almost a century ago. 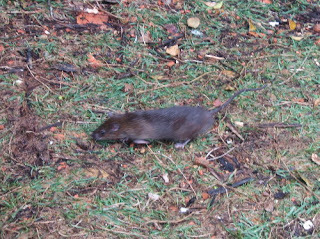 Wasn't there a genuine 'Giant Rat' discovered and reported by the 2009 BBC TV documentary mini-series, 'Lost Land of the Volcano' ? Yes indeed, and as far as I know its species still awaits formal scientific description and naming.